From December 17 through December 31, Today in Energy will feature a selection of our favorite articles from 2018. Today’s article was originally published on October 26. Another article discussed solar becoming the third-most prevalent source of renewable electricity. 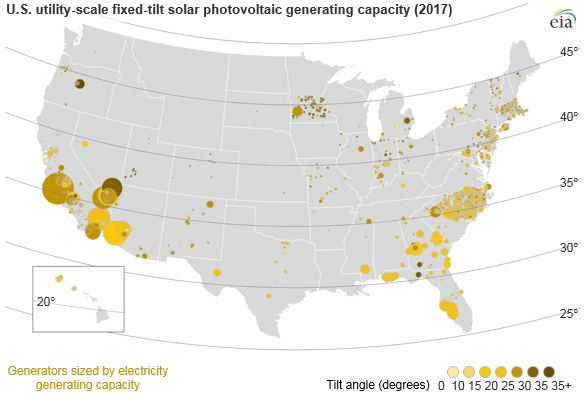 Nearly 40%, or 10.4 gigawatts (GW), of utility-scale solar photovoltaic (PV) systems operating in the United States at the end of 2017 were fixed-tilt PV systems rather than tracking systems. 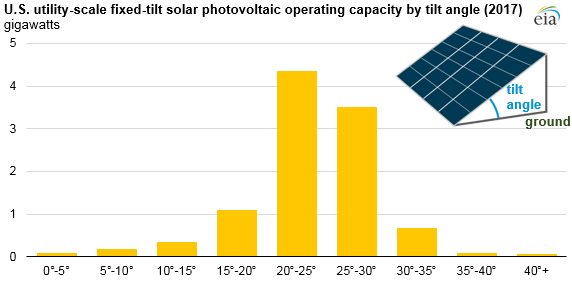 Of the utility-scale fixed-tilt solar PV systems, 76% of the capacity was installed at a fixed angle between 20 degrees and 30 degrees from the horizon. The amount of electricity generated by a fixed-tilt solar PV system depends on the orientation of the PV panels relative to the sun. The panels of a solar PV system collect solar radiation more efficiently when the sun's rays are perpendicular to the panel. Fixed-tilt PV systems use two separate angles that determine their orientation relative to the sun: the azimuth and the tilt. The azimuth specifies the compass direction that a tilted panel is facing: north, south, east, or west. Most panels in the Northern Hemisphere are south-facing. The tilt is the angle from the horizontal ground. A tilt of zero degrees means that the panel is lying flat on the ground, while a tilt of 90 degrees means that the panel is perpendicular to the ground, like on the side of a building. Latitude is often the primary factor that determines the tilt of the panels because tilting the panel toward the south at an angle equal to its latitude will maximize the panel’s annual exposure to direct sunlight. In the United States, systems installed at lower latitudes (further south) typically have shallower PV tilts, while systems installed at higher latitudes (further north) typically have steeper tilts. 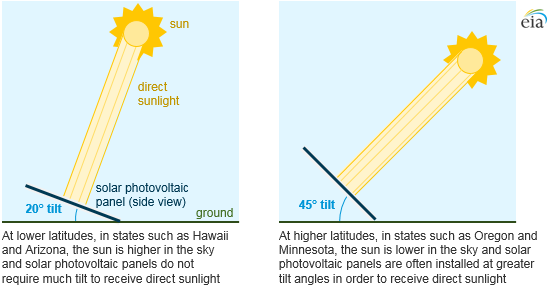 U.S. utility-scale fixed-tilt PV systems are located at latitudes between 20 degrees (Hawaii) and 50 degrees north, in states such as Oregon and Minnesota. Panels are often installed at a shallower tilt than would be indicated by latitude because of other factors such as height limitations, shading concerns, and system layouts. Systems with tilt angles less than the latitude angle of the plant’s location are expected to have enhanced output during spring and summer months when the mid-day sun is higher in the sky, at the expense of reduced output during fall and winter. In recent years, solar power plants have increasingly been installed with tracking systems instead of fixed-tilt systems. Tracking systems either rotate on a single axis (typically east to west) or on a dual axis. Although tracking systems are more expensive than fixed-tilt systems, revenue from the additional electricity generated by following the path of the sun across the sky often exceeds the increased cost. Because the tracking mechanism is designed to track east to west, many existing single-axis tracking systems have a tilt of zero degrees.